Flash will always have a special spot in my heart, because he appeared in one of my favorite comic books ever: http://www.dccomics.com/graphic-novels/titans-vol-3-fractured. Anyway, I’ve never read his regular series: why are you enjoying so much, and why should I try it? Wouldn’t say I’m enjoying it. 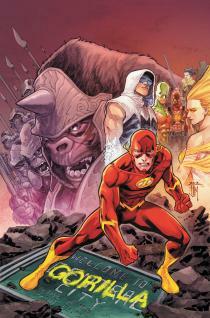 It’s more I can’t quit it: I like what Francis Manapul is doing art-wise, and I’ve always been a fan of the Rogues. Now, I almost called an end to this madness after #0; but Manapul-ed me in with the end of the issue: Grodd and his gorilla army got me goin’ bananas! Yeah, it’s not time to say goodbye–not quite yet.